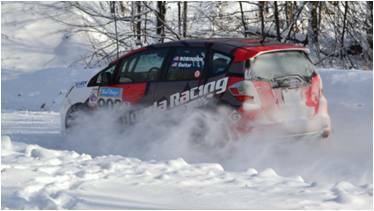 Team Honda Research is partnering with Honda Performance Development to showcase the B-Spec Fit developed specifically for Rally competition at this famous winter Rally event. “Based on the interest from the inaugural year of B-Spec in 2012, we wanted to come back and run a full season to showcase the true competitiveness of the B-Spec Rally Fit," stated James Robinson, Honda Engineer and driver for THR. “Looking forward to 2013, we hope to have more competition and excitement in the class with continued involvement from Ford Racing and Toyota”. The Rally B-Spec Fit made its debut in the 2012 Rally America B-Spec class, with a limited schedule to prove out the rally kit being jointly developed by HPD and THR. Of the three events entered in 2012, the B-Spec Fit was able to get a first-place finish at 100 Acre, and a second at STPR. 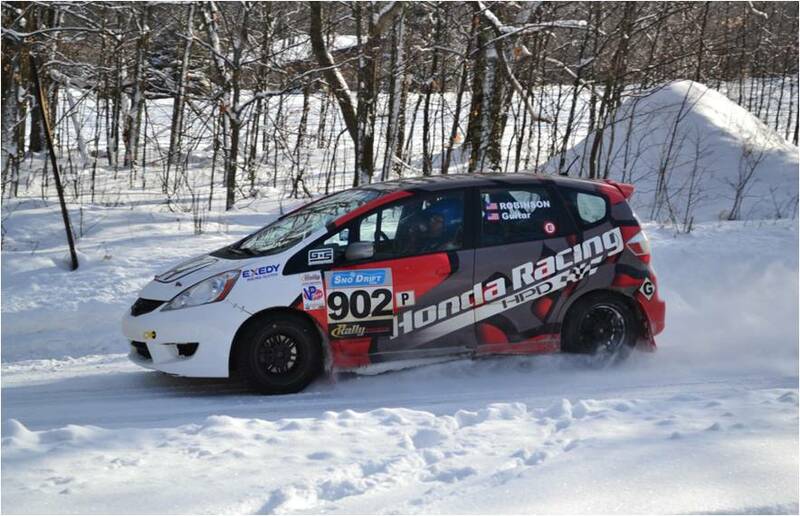 The one DNF occurred at Sno*Drift, and the team was back this year to tackle the tough ice and snow event. Even with only three events entered, the B-Spec Fit was able to clinch second place in the 2012 B-Spec National Championship. HPD and THR started the challenging first round of the 2013 Rally-America Rally series in hopes of bettering their finish at last years’ Sno*Drift event. Said Robinson at the start of the event, “Our primary goal for this event is first to finish, and then worry about finishing first.” Eight stages made up the first day of competition, and even with cautious driving strategy, the B-Spec Fit was able to build up a three-minute, 46-second lead over the second-place B-Spec Ford Fiesta. “We’re pleased with the performance of the car today,” Robinson, said, “and we have had no issues to worry about at service. In fact, we’ve been averaging over 20 miles per gallon so far!”. Moving into the second day of competition, which included 12 new stages, the B-Spec Fit continued to set steady stage times over its competition. By Stage 11, the Fit team got word that the second-place Fiesta was out of the competition. “After we got word on the Fiesta, we decided to run a safe strategy and make sure we brought the Fit home for the win,” Robinson said.